It’s been a couple years since I have been to Hagen and I almost got lost on the right road. 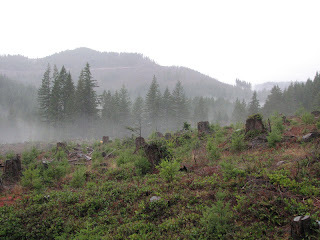 Where there used to be a tree covered hill or I should say hills, it’s now clear cut and bare. And now the old hike in is getting overgrown and tough to find unless you know what to look for. 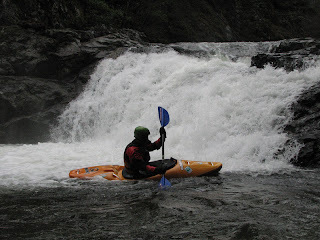 Once we were on the creek Luke Spencer, John Boone and I were rewarded with a great flow. 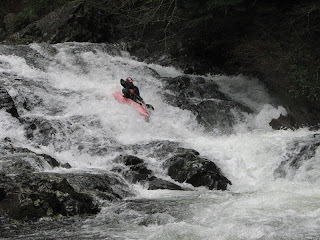 Euphoria at a fast and fluffy flow. 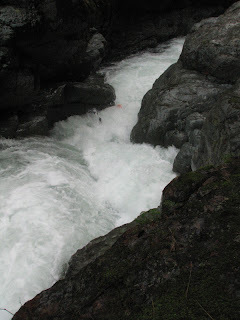 Teakettle Falls from the top. 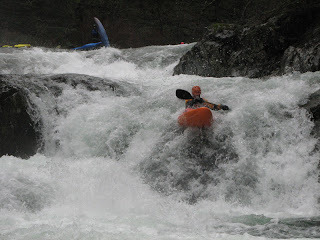 Luke Spencer running Teakettle Falls. 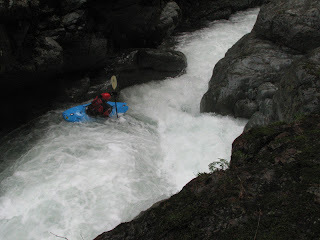 Early season with water on the rise has proven to be the best way to see Hagen Gorge with water. 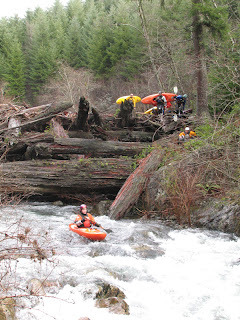 The high water helped out Hagen Creek tremendously. 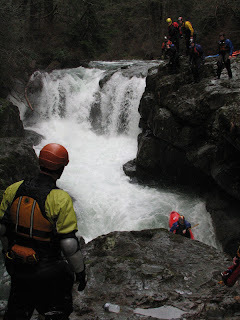 Teakettle and Double Falls were a little on the pushy side.. The hike in is starting to fill in..
Last week I convinced a few paddlers that Hagen gorge would be good, possibly even high water! 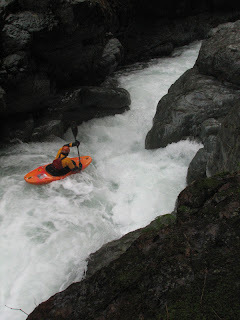 I have tried to get on Hagen at higher flows a # of times, but it always seems to be the same flow in there. 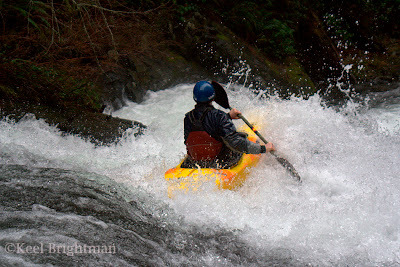 I think the peak flash flood day is the only way to see this run at high flows. After this run I have come to one conclusion…the water level on Hagen can never be too high! 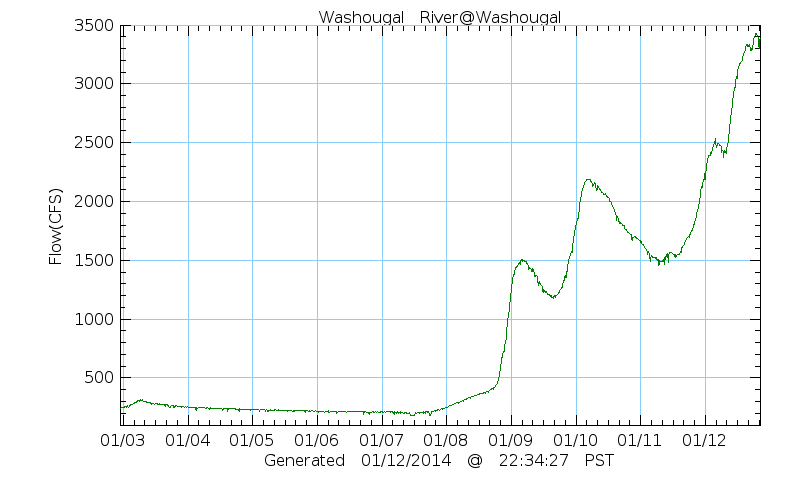 Flows: No lower than 7,000 on the Washougal River, however this drainage seems to act on its own, and is only at a med/high level at peak rain and a high freezing level. 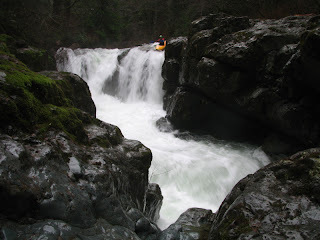 + paddlers put on Hagen Gorge today. Here are a few shots. Most of these photos came from the N.F. 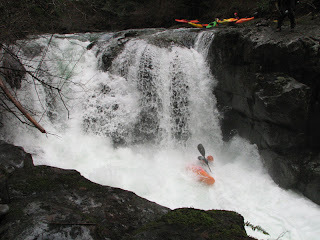 of the Washougal. It was one of those days where if you ‘know’ the run, you just stay in your boat. 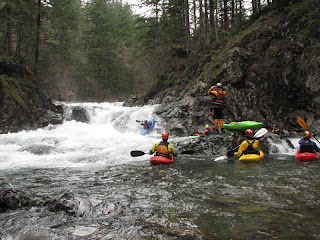 There are limited eddys above most of the drops on Hagen and with this many paddlers coming down stream it was best to stay out of the way as much as possible. 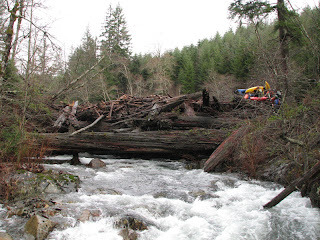 The log jam above the gorge. 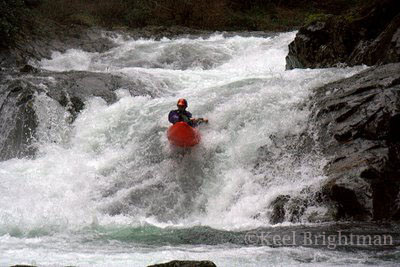 Keel Brightman on Teakettle Falls, N.F. The crew waiting on the outcome of another run through Teakettle. 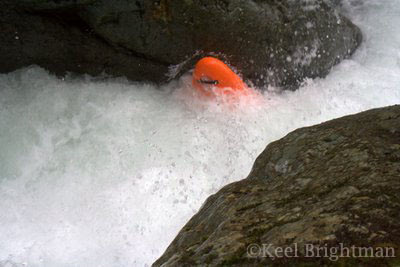 Here’s a sequence of Keel running the Double Falls on the N.F. 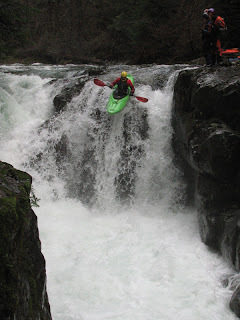 James Bagley Jr. running the bottom drop on Double Falls, N.F. 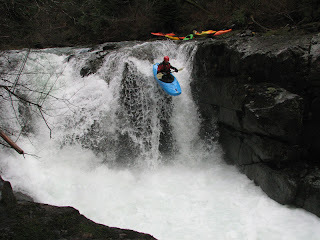 Jon Fowlkes on the Double Falls, N.F. 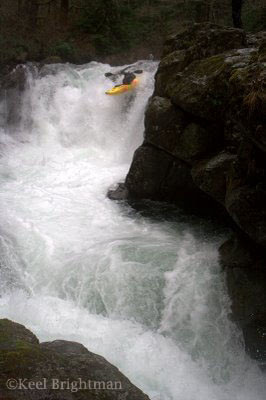 Rob on the Double Falls, N.F. 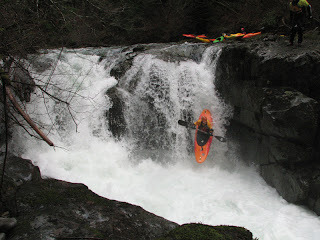 This gorge was first run by Jason Rackley, James Bagley Jr., Mike Long, Pete Giordano, and Jon Fowlkes on one of their epic weekends were they explored the tributaries in the Washougal drainage. 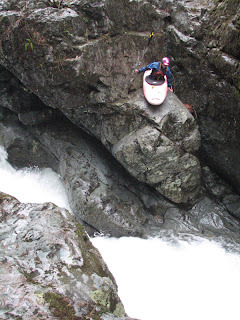 They called it their 4 in 3 weekend, running 4 unknown tributaries in just 3 days. 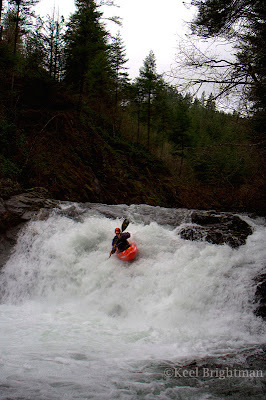 With Hagen being the best bang for your buck and being that close to Portland it was certain to become a favorite for the local paddlers. Everyone left Hagen this day with big smiles on their face! 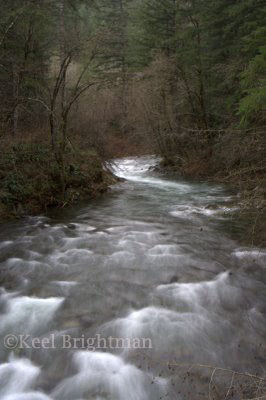 Looking up into Upper Hagen Creek. 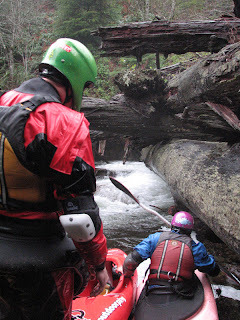 Jason Schroeder and Heather Herbeck on the log jam portage. 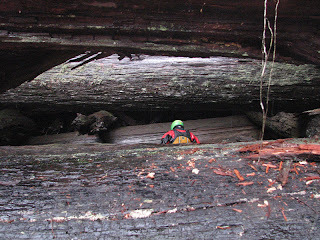 Jason crawling through the logs under the log jam. Jason below Hagen Daaz Falls. 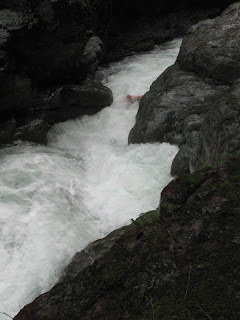 Heather running the top drop on Euphoria Falls. 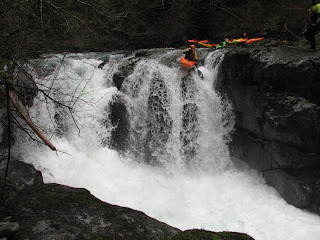 Jason on Teakettle Falls, N.F. 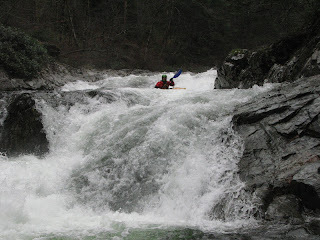 Jason on the Double Falls, N.F. Heather on the seal launch around Double Falls.